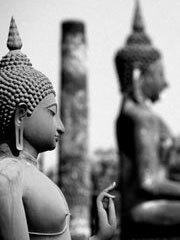 The Mahāsaṃghaka (Majority) sect of Buddhism was formed in the first Buddhist schism around 320 BCE. It split from the Sthaviravāda (Elders) school. The Mahāsaṃghikas were primarily situated in Northwestern India but also with an important presence in southeast India around Amaravati and Nagarjunakonda (the Sthaviravādins were in the Northeast). The Mahāsaṃghikas differed from the elders in including lay practitioners and non-enlightened monks at the communal meetings which constituted the governmental body for each saṅgha, allowing monks to use gold and silver and eat twice a day, and also asserted that the historical Buddha was a manifestation of a transhistorical Buddha, and phenomena are illusory and empty. The Mahasamghaka are often regarded as one of the sources of Mahāyāna doctrines.